As a child my favourite dessert of all time, was my Mother’s Chocolate pudding. What a treat! Somewhere in my early twenties, Mum gave me a recipe book with a few of my favourites in it that she used to make me when I was little - one of which was the chocolate pudding recipe. There is something about comfort food – that I find, so well…comforting (funny that). Chocolate pudding is definitely one of those foods. Come winter time – there is something so delicious about being all wrapped up and snuggly with a lovely bowl of warm chocolate pudding and ice cream. Yum – I’m getting cravings just thinking about it. Anyway – this entry is not about chocolate pudding it’s about the vessel that I cook it in. 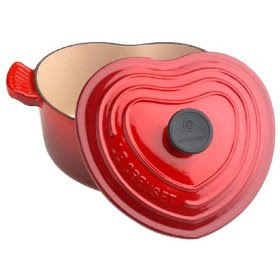 Given to me as a gift – the heart shaped Le Creuset casserole would have to be one of my favourite kitchen items. Cast iron – whilst heavy – makes me want to cook. 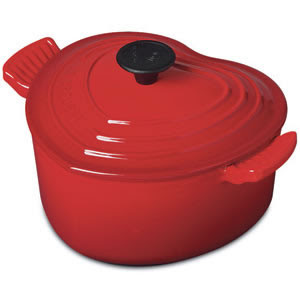 The few pieces we have – a wok, a square skillet grill and an oval French oven all get a good working out in our kitchen and of course what better a vessel to cook and serve chocolate pudding in then a heart shaped one. Heat butter and milk in saucepan, stir until butter melts, add vanilla. Sift dry ingredients into basin, add butter mixture to well in centre, stir until smooth, pour into deep, greased 1 litre (2 pint) oven proof dish. Sift topping over, carefully pour hot water over. Bake in moderate oven 40 – 45 mins. Serve with fresh cream or vanilla ice cream – Enjoy! Thank you, that pud sounds delish! !